Fully open the Primary and Airwash controls. Place a firelighter or paper together with dry kindling wood on the grate and light the firelighter or paper. Leave the door slightly open as the fire establishes and the glass warms, avoiding the possible build up of condensation. Add larger pieces of wood to build the fire. Too many logs may smother the fire. When the fire has fully established close the Primary air control. Use the Airwash to control the burn rate when the appliance is at operating temperature. Open the Primary and Airwash controls fully. Rake the embers over the grate to establish a glowing fire bed (if the fire bed is low add a small amount of kindling wood to help re-establish the fire. Place new logs in an open arrangement to allow oxygen to easily reach every part of the fire. Compact loading will make the wood burn slower; cause the fire to smoulder and produce more smoke. Burn the new logs at high output for 3-5 minutes before closing the primary air control. Adjust the burn rate using the Airwash control. Do not close the air controls until the fire is burning well. Refuel little and often for clean, efficient burning. Experience will establish the setting to suit your needs. Ensure your logs are well-seasoned and dry. Hardwood logs also have around twice the calorific value of softwoods. Do not burn large amounts of fuel with the Airwash control closed for too long. This reduces the glass clean effect, causes tars/creosotes to build up in the appliance and the flue system and will produce excessive amount of smoke. 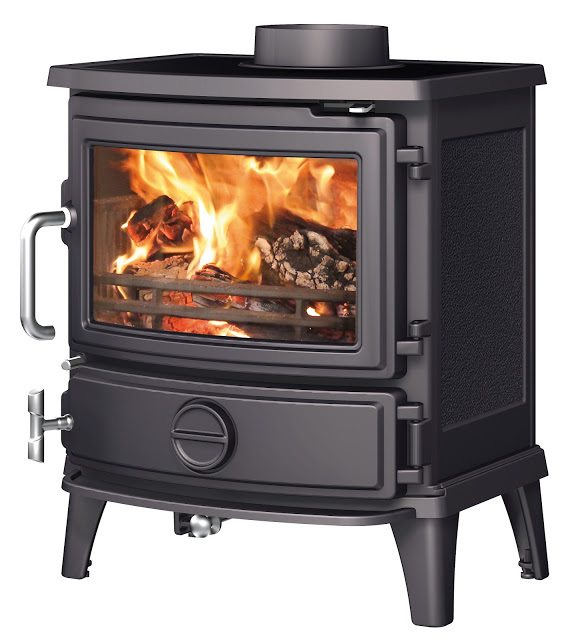 Burning the stove at high output for a short period also reduces tars and creosote. Do not load logs above any log guard that is fitted, or any secondary air outlets in the back of the firebox. A bright and clean firebox indicates the stove is burning well. Fully open the Primary air control and half open the Airwash control. Add slightly larger pieces of wood to build the fire. Add your fuel. This must be anthracite, smokeless fuels, turf/peat briquettes etc. suitable for closed appliances. Do not smother the fire. Fully open the Primary air control to fully establish a glowing bed before adding more fuel. Allow the fuel to burn at high output for a few minutes before adjusting the Primary air control to your desired setting. Do not load fuel above any log guard that is fitted, or any secondary air outlets in the back of the firebox. A bright fire indicates the stove is burning well.